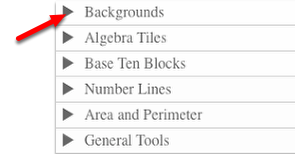 This tutorial describes how to use the Algebra Tiles including additional features. 1. The top bar has three main parts: Pen & Paper Icon, '?' Icon, and the Arrow Icon. Options - Add Title and Description and Enable/Disable Tools. Clear Tiles - This will remove all the tiles that are in the tile area. Save - This will save all the changes made. 2. Select the '?' icon for directions. 3. Select the Arrow Icon at the right to open and close the tray. 2. Drag tiles from the tray at the left to the display area at the right. 1. Select one of the tiles and drag it to the tile area. 2. Use the sliders in the tray to change the size of the tiles. 3. 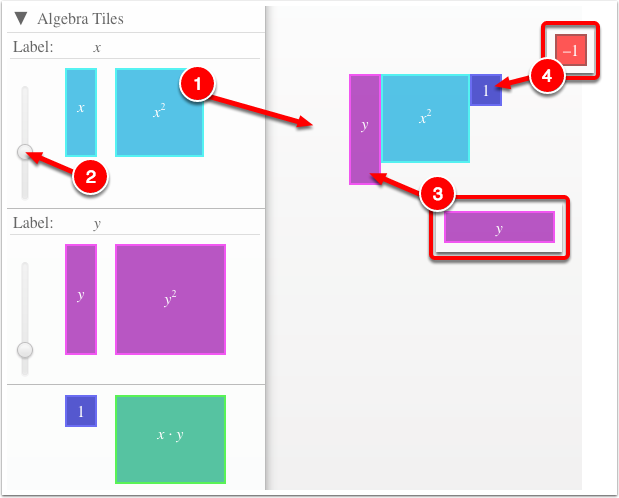 Double click tiles to change orientation (horizontal/vertical). 4. Click on a tile once to change the sign (+ –). Note: The color of the tile will turn to red for negative sign. 3. 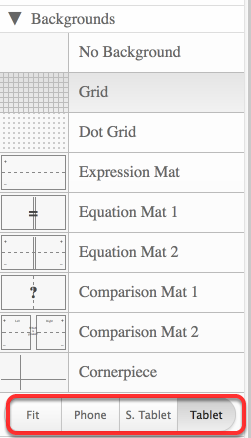 Choose from a variety of different mats. Also choose from a variety of sizes to fit on various devices. Click the arrow next to the tool to view/hide the options for each tool.